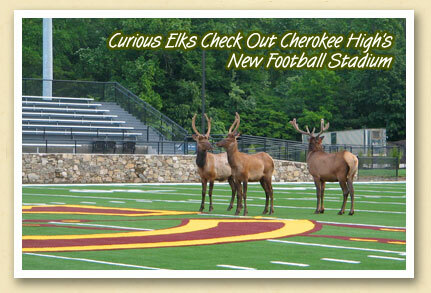 The three Elks wandered out of the Great Smoky Mountains National Park for an impromptu tour of the new Cherokee Central School scheduled to open in September. Architect Scott Donald of Padgett and Freeman took the photo while the animals were checking out the new football stadium. Scott and associate Maggie Carnevale designed the state-of-the art facility which will consolidate all of the Eastern Band of Cherokee Indians’ schools into a single 473,000 square-foot Pre-K – 12 campus. It includes a new elementary, middle, and high school, as well as a 1000-seat performing arts facility and the 3500-seat football stadium. For more about the new school, visit the Padgett and Freeman web site.